A neutral nod to the stars and stripes, the Ellis Collection features enzyme-washed canvas fabric in taupe, pearl, chestnut, accented with meta star rivets and pearl stitching to resemble the American flag. Trimmed in brown leather and antique brass hardware. Lined in antique white and ash gray ikat printed cotton fabric. 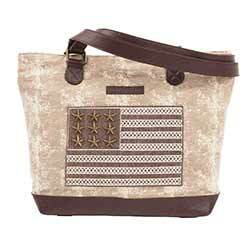 Ellis Market Tote, part of the Bella Taylor line by VHC Brands. Ellis Rucksack, part of the Bella Taylor line by VHC Brands. Ellis Shoulder Tote, part of the Bella Taylor line by VHC Brands. Ellis Wanderlust Tote, part of the Bella Taylor line by VHC Brands. Ellis Weekender, part of the Bella Taylor line by VHC Brands. Ellis Wide Tote, part of the Bella Taylor line by VHC Brands.